These flutes are made by hand, using files, chisels and hand tools to shape the wood. All holes are burned in with a hot metal rod. I use an electronic tuner to insure the flutes are of concert quality. All art work, paintings, wood burning, and sculpture is done by free hand. Each flute is a new artistic challenge that I look forward to. Below are examples of flutes that have already found a home! This one of a kind flute is from my personal collection. This one of a kind Drone is made of African Padeau, Black Walnut, Mahogany, Maple, Osage Orange, Locust and Oaks. The old hand carved Roadrunner totem is from Arizona. Special one of a kind flute, with Jade heart totem and matching beads, with personal group hug design. Hand carved and aged to give the look and feel of the Earth.
" Red Tail Hawk "
Hand carved head of the Red Tail Hawk graces this Alaskan Yellow Cedar dual chambered flute. Beautiful wood burned Hawk feather along the finger holes. Alaskan Yellow Cedar. Decorated with wood burned and painted design. 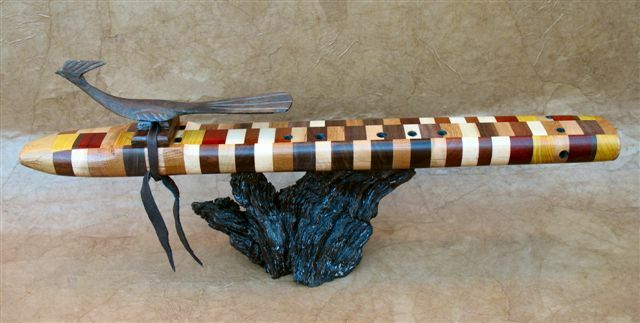 Alaskan Yellow Cedar flute with Coastal Salmon wood burn.
" Horse Alaskan Cedar Drone ( dual chambered ) with detailed carved horse head, running horses wood burned along the finger holes, painted accents decorating the mouth piece and foot. Alaskan Cedar Drone ( dual chambered ) with detailed carved Wolf head, Wolf howling at the Moon wood burned at the foot.